We must admit to being surprised by the strength of the response to last week’s poll: 655 readers clicked a button to let us know their opinion on this subject, and the comments section was a hive of constructive debate for much of the week. 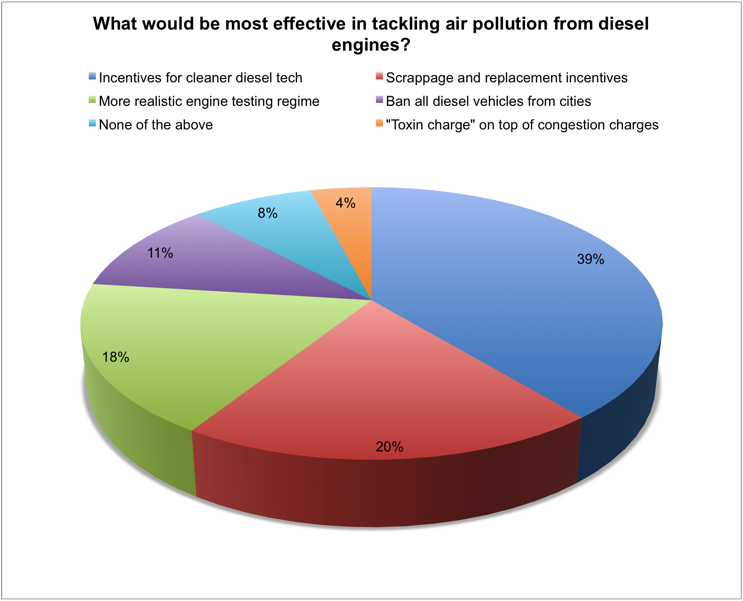 No clear majority emerged for any one option, but the largest group of respondents, 39%, thought that improved incentives for developing cleaner diesel technologies would be the best way to tackle the problem that regulators fear is damaging health, particularly in cities. Several commenters suggested filter systems and other ideas such as combustion analysis to reduce levels of particulate emissions and NOx. The second option, 20% of votes, was a scrappage scheme to encourage replacement of older, dirtier vehicles. Slightly fewer, 18%, wanted to see more realistic testing regimes for diesel engines; 11% went for the option of banning all diesel vehicles from city centres, although several commenters pointed out that this would be difficult to enforce, particularly as buses and commercial vehicles tend to run on diesel and are among the biggest contributors to the air pollution problem. The “extra tax” option of an additional “toxin charge” on top of congestion charges was the least popular option, with 4% of respondents, and 8% declined to pick one of our suggested options. We would like to thank everybody for their contribution to the discussion, and would encourage readers to continue to send us their opinions on this subject. I see no option on here that is really viable so I have to vote for none of the above, I personally don’t think there is a quick fix. As for a toxin charge, it just seems like another license for the government to print money. The most palatable fix is to just threaten diesel car drivers with extra taxes. Just say “taxes on diesel cars will keep increasing until city pollution become acceptable”. Then people will stop buying diesel and the problem will go away, probably without having to introduce putative taxes. “Scrappage” is very objectionable. I purchase a petrol car that causes less pollution, so why should I (through taxes) have to subsidise the motoring of people who are guilty of pollution. Need to understand ALL the issues that exist. 1. Diesel does create more NOx in the engine, BUT After Treatment technology also exists. 3. VW (and others?) cheated, and are now paying the price, even if their share price and market share has recovered. The government have known about this for years. So yet again we will get hammered for more taxes. I used to work in R & D for a diesel engine manufacturer. There is no quick fix. This should have been discussed when the government pushed the sale of diesel cars. It’s time the government stopped treating the general public as being stupid. Differentiate the particulates coming from tire rubber, the particulates coming from the road asphalt and the leftover is from the diesel. Put concrete/cement road instead of asphalt (durability, lighting, oil import, fuel economy). Then force the constructor to use a proper radiator with the engine: a lot of emission improvements are wasted because after the research and dev, a rubbish radiator is used to cool the engine. Make the test for emissions for manual gearbox using a man changing gear. The main emissions are coming from the gear changes and transients, not on a steady-state operating point. Find the improvements from there. I am not sure that I am well enough informed to vote, e.g. my 17 year old diesel has a cat. is that not meant to remove some of the bad things? I have to admit that I don’t know what it catches and what it lets go. Is the filtering / conversion technology there to remove the bad stuff? I don’t think the ban is practical at this stage, how would goods be delivered into cities, petrol powered lorries? with lower fuel efficiency, lower range, increased fire hazard? Engines should be banned from city centres, apart from permitted vehicles (eg essential deliveries / services). I also believe that more and better R&D on engines should be government policy encouraged; but don’t give them any more excuses for taxing fuels than they already have! We also need to ensure that sensible policies are adopted regarding pollutants as the present meja approach is to claim that thousands will die early etc. based on a few extremist opinions and dubious statistical analyses. “What would be most effective in tackling air pollution from diesel engines?” – there is only one answer to this question – ban all diesel vehicles from cities. However this will take time as diesel cars, delivery vans, buses and even trains will have to be replaced. Who will pay for this? I am sure that Diesel nox emissions can be reduced. The technology exists. This is proved by the fact that large commercial vehicles produce less nox than some cars when measured in a normal road test. This is because the legislation specifies that the large commercial vehicle emissions test in performed under normal road conditions. (Source Radio 4 today). The tests for cars is a very precisely specified test on a rolling road. This gives manufacturers the wrong target. Change the test specification to a road test and nox can probably be reduced significantly without having to dump an excellent technology (diesel) that manufacturers have been spending a fortune on developing for years. We should follow the German type principle – perhaps accelerated, where they gradually phase in charges in city centres for older cars. Thus there would be a charge for pre Euro 5 emissions soon. The best investment of all would be public transport within cities. Cheap park and ride. Electric Trams. Electric Bus. Who would drive into a major city if it was easier & cheaper to park and ride? But do not write diesel off. It produces low CO2. I am fairly sure nox can be reduced. The problem is the result of a bad test specification (EU + Government). Improving Diesel rapidly is probably the fastest way to significantly reduce the problem. We should avoid a knee-jerk reaction. But this is the only type of decision? that Governments know: and they know no better. Short term policy – “Diesel is better”, long term effects – Todays diesel car purchase has probably at least 10 years life ahead of it. We’d need to get rid of the backlog before seeing significan t improvement in air quality. Personally I would happily swap my daily 70 mile round trip commute for public transport if a) it didn’t cost more than me in my car, b) it was reasonably time efficient c) it wasn’t overcrowded. Unfortunately the best public transport can offer me is a) 1.5 times more expensive than my car (including hidden running costs) b) an hour and a half longer each way (3 hours daily) if everything runs on time c) massively over crowded. Regarding c) I fail to see how train and bus operators can be allowed to oversell the capacity and still be legal, let alone claim any kind of passenger safety. If I put 8-16 people in my car (assuming 5 seater), I’m sure the police would soon be on top of me. Can a diesel be modified to run on direct injected LPG? I think I have seen this in relation to military vehicles. It might affect the kilometres per dollar too much. I expect it would be a costly conversion but perhaps subsidising this would be a good investment in the community health. I think diesels can be converted to CNG, so this could be pliable to HGVS and buses. As an alternative to petrol, LPG is just about cost-competitive with diesel and slightly less carbon intensive than petrol and good for particulates. But I don’t know about NOX. In Glasgow the highest pollution & pedestrian areas are restricted to buses/taxis. Our toothless local politicians ain’t going nowhere fast, increased testing for worst offenders is about it, & a few noddy P&R, no real opportunity to fleece the already heavily taxed motorist. I agree with Dan. Also, as far a Toxins are concerned, doesn’t unleaded petrol contain Benzine? It is high time that you stepped up to the plate and investigated this from a technical perspective. Water has been known for a long time to have many beneficial effects on combustion (Henry Ricard in the 1930’s). Back in the war later Focke Wulf190 and some Spitfires (plus others) ran water injection to permit higher boost strategies and to wring out more power at high altitude. In the 1970 / 80’s Volvo and SAAB both studied water injection pre-turbo with good performance effect and impact on emissions. This has been documented in recent studies that water can help in emulsified fuel (http://www.clean-fuel-ltd.com/what-we-do-clean-fuel/) and water injection. So how does it help – heat of vaporisation cools the exhaust reducing NOx the transition to steam helps radically reduce soot – enabling greater EGR without engine fouling so further NOx reduction. I have heard claims of up to 80% NOx reduction. There is something in it, look at the latest M4 BMW petrol. Now if you use up to 20% ethanol you improve the cooling effect further – so use your screen wash slightly diluted- it;s all there and in the supply chain. I had a long chat last year with a chap called Richard who owns Aquamist.co.uk a specialist in water injection – he tried for years to talk to London governments about the cleaning effect of water. Here’s a quote from his forum. I had the same idea as you in 2003. I spent a good six hours on the phone to the UK government’s environmental protection agency. I tried to ask them to give us a small grant for developing a nitrous reduction system for diesel engines based on a proven concept of water injection. I started at 9am to one department, got passed onto various agencies until I gave up at around 4pm. None were receptive to the idea, none ever heard of the concept. I called at least 40-50 agencies. Each successful human contact just gave me another new number to call. Some numbers were just an answering machine, left many messages for them to contact me on their return. I had a sheet of A2 paper, by 4pm it looked like the flight route of an airliner with hundreds of short notes, the sheet was filled to the brim. Finally I was very happy when the last phone number linked back to the first number I called. I did not get one return call for the next three days. I guessed the message was clear that they are not interested. So I decided to put my effort to make the cars less greener and pumping out more CO2s. Plan B worked to this day. Final comment, when a cylinder head fails on an engine how much carbon is present in the local cylinder with the water leak? Silly me – if engineers fix it the government needs to find something else to tax. are we saying that there is no way to improve filtering? Why is it DEFRA’s figures don’t support this latest eco fad and proposed government meddling? So according to this DEFRA report NOx is steadily reducing and 79% of particulates are from the use of wood as fuels. It seems to me the answer that should be on this poll is [ ] Ban the use of wood as a fuel and keep developing cleaner use of petrol and diesel. Hmm! somewhat against the current ‘green’ thinking. Give me a website where I can report smoking vehicles, with License plate, location and time. My “favourite” smokers are buses. As a cyclist I either try to overtake them or stay away from them as far as possible. Have police check smoking vehicles, instead of chasing cars that have no insurance. Put cameras at bus stops, and behind junctions. Especially at a steep hill. Charge £50 each sighting. One day and the city’s finances are fixed for the year. The dangers of diesel emissions was well known in the 90’s and still the car manufactures massaged the figures to make more money. The EU should never have trusted the figures presented by the car manufactures as correct. They should have tested the emissions themselves. I started work for a Heavy Vehicle manufacturing company in the 70’s , and I learnt my first big word ” Carcinogenic ” It’s a shame politicians are not as well educated. Your article sort of, kind of, skirts around, doesn’t quite, mention lorries , buses or taxis,more common in cities than pigeons, and yes “electric” versions are available but in small numbers and huge costs. That’s why I mentioned operators of fleets of diesel vehicles. I too have voted ‘none of the above’ as I feel that there is no quick fix. those of us who purchased diesel vehicles based on the government advice should not be penalised retrospectively for ‘doing the right thing’ as it was seen at the time. with the improvement in petrol engine technology, particularly on fiesta sized car, I will go back to petrol next time. Any scrappage scheme introduced before I decide to change cars again will, without doubt, not be enough of an incentive to cover the worth of the car to me. I would object most strongly to being penalised (yet another tax in my mind) for driving a diesel. Like the first replyee, I see no option that will be fair to existing diesel car owners. Diesel was encouraged because carbon dioxide emissions were less than from petrol cars, and carbon dioxide was then the favourite pollutant. Now that has changed, the scientists should be looking for removing pollutants from the diesel at the manufacturing stage or devise an “ad-on” to remove it from the exhaust. Co2 is not a pollutant. Co2 is an essential ingredient to live on earth. If it fell below 150PPM all life on earth would die. It is still only 403PPM. We would be better off as a planet with additional greening which is taking place now, if the Co2 PPM went up to 800. We need Co2 it is life supportive. Try breathing it. Or rather, don’t. You would not be aware of it in a breath even if it went to 2000PPM and you would come to no harm whatsoever it you were breathing it at that level. Nitrogen is 80% of the air we breath Co2 is currently 0.04% it is harmless colourless and not toxic. I drive a diesel car with a Euro 6 engine, a standard which was introduced in September 2014. If you compare the emissions from a Euro 6 diesel and a Euro 6 petrol you will find that for CO emissions the diesel is better, for NOx slightly worse (0.008 vs 0.006) and for particulates the same. The Euro 6 diesel produces 1/2 of the NOx of a Euro 5 diesel and 1/3 the NOx of a Euro 4 diesel. I would argue that the automotive industry (if they don’t cheat during testing) have done a sterling job in reducing diesel emissions on new vehicles. The pollution problems in our cities seem to be related to a number of issues, not just diesel per se – too many vehicles, older passenger vehicles, older buses and HGV’s, poor traffic management, etc. A simple ban on diesels is a very blunt stick approach to a complex problem where a more holistic approach is clearly required. Edward, can I suggest you check very carefully what the manufacturer of your vehicle says is the expected pollution and what is the actual level. drivers who thought they were doing the right thing by switching should not be penalised. Did I miss this mass outbreak of altruism then? The vast majority of people switched to diesel because it made economic sense at a personal level, not because they suddenly had a green epiphany. A major source of pollution is the truck / coach. We won’t ban “all” diesel vehicles, all we would do would be to ban diesel cars and possibly some vans. Much better to focus on clean technology which cleans up all emissions. What has suddenly happened to CO2 emissions? not important any more? What about using less of earth resources, ? Petrol engines are still more thirsty than diesels. Politicians yet again cherry picking issues to suit some narrow objective, and ignoring the wider pictures. Technology exists to reduce emissions – the worst polluting diesels were manufactured by VW – they are now the producers of one of the cleanest diesels around viz. the new Passat. There is no sound reason why this technology could not be adopted by other ‘dirty diesel’ manufacturers. Perhaps the financial penalty should be on the car manufacturer rather than the car driver. Read the DEFRA Report!! That nice clean fuel, wood is responsible for a lot of extra PM pollution, on top of what the nasty diesel provides. Unless someone knows something I don’t vis energy generation. The idea we can all move to electric vehicles quickly and expect the electricity mains to take the strain is delusional. We need to stop using diesel engine vehicles which came into vogue following a misplaced Green lobby belief they were less harmful for the environment that petrol engine vehicles. That proved to be far from the truth. Now we are being told we must adopt electric vehicles, this is being championed by the same Green lobby who got it so wrong the last time. Maybe, we need to start asking proper engineers what are the actual options available and stop listening to the shill voice, of the often well intentioned but sadly ignorant lobby groups. With the Taxervatives holding the dictatorship we should have expected this. Find a problem don’t try to fix it just tax it. Everyone with a diesel vehicle should be given full market value (or petrol equivalent ) for their vehicles as an incentive to change them. We were all encouraged to drive diesels because they were cleaner and used less fuel, Diesel was around half the price of petrol and you could drive twice as far on it, but the tax party took advantage and doubled the price. I had a vehicle running on LPG the fuel costs were around a third of petrol, now its around two thirds, LPG was supposed to be the friendly “waste” product from petrol production. With regard to particulates, I am sure that electrostatic cleaning can be employed. It is used industrially. Water bath cleaners? I drive a diesel Motorhome. I do very low annual mileage. A truck or bus does high mileage. This surely points towards placing road fund tax (as it used to be called) on fuel. The haulage industry will scream but they are doing the most damage. They also wear out the roads more too! Hydrogen is a great fuel if you can control its explosive combustion but then someone has to make the hydrogen. Electric Cars are great but wait until 25,000,000 plug in at night for their top up. We simply do not have the generation capacity at the moment. Ardian, what we need is straight forward nuclear power stations and lots of them. No need for batteries, if we had excess electrical power at low cost we could synthesize all the liquid fuel we would ever need, all fully natural drawn from the atmosphere and recycled back into the atmosphere. Our motive transport tanks would be filled with fully environmentally neutral fuels. Oh and one other benefit. We could stop using bioethanol in fuel and use the food to feed the starving in the world. The problem here is trying to separate the science from the rhetoric. We use the term “pollution” as a general catch-all description without defining what we mean. Similarly we use the term “the environment” rather loosely. It rather depends which demon you chose to declare as the enemy. If climate change (a planet-scale issue) is the big concern then CO2 emissions are of greatest importance and diesel engines are “a good thing”. However, if we choose to be more concerned about local air quality (a city-scale issue), then particulates and NOX become important and diesels are “a bad thing”. Loose definitions of “pollution” and “the environment” allow us to change demons at will. Unfortunately, politics is about rhetoric and about making us feel guilty so that we accept an increase in taxation. I’m old enough to remember the pea-souper smogs of the 1960’s. Are politicians really trying to convince me that air quality (another loose definition) has got worse since then? Diesel engines in cars, yes banning is possibly a good option. Though it wasn’t that long ago that the Government was trying to get more people using diesel. Now expecting people to cough up for millions of replacement vehicles because the Government has changed is mind is rather less than helpful. However, the poll talsk about diesel engines – full stop! For anything commercial, vans, heavy goods, tractors, plant and so on petrol engines are not a viable option without also incurring huge consumption figures. If there was a permanent reduction in VED and associated VAT for commercial use then that would help offset the massive increase in consumption. If not, then a two-tier option is the only answer. Diesel engines are charecterised by very high low rpm torque, which is essential to get and keep heavy vehicles and loads moving. This is another classic example of a one-solution fits all scenarios so beloved of governments. Which merely proliferates unplanned and unwanted consequences because they put their blinkers on when promoting their pet schemes. Lots of diesel cars nowadays is a direct consequence of previous government policy. Micro Turbine engines have only single digit NOx emission. Few Hybrid electric buses are operating in Russia and Europe with these engines. Wonder why when already proven air bearing technology in these engines have clocked several thousand hours, it is still not widely accepted. Of the taxes raised from motorists, only about 1/7th is reinvested in roads (new roads and upkeep). So, no more taxes on drivers of any sort! Steady changes in the tax regime over a decade or so will shift drivers toward petrol, hybrid or all electric vehicles without the need for knee-jerk reactions. Concerning electric cars – why doesn’t the government set up a standard for battery packs so that depleted batteries may be rapidly changed for fully charged at a filling station in no more time than filling with petrol (or diesel). Interesting that ammonia emissions have started to increase over the last couple of years. Wouldn’t be anything to do with using urea to reduce NOx emissions would it? Originally diesel engines were designed to run on vegetable oil they were modified to run on mineral oil because there was pressure from the oil producers. If we convert them back to vegetable oil the toxic pollution is more than halved. But who has the power to stand up to the vested interests. There is no merit it taking food from the empty mouths of the hungry, to fill the fuel tanks of the developed world. Biofuel is a bad, no, make that an unethical idea. As a modern diesel owner (coming up on 3 years old) I feel particularly duped by the then green notions of the time of purchase. As has been pointed out a massive uptake in electric vehicles isn’t practical as the grid capacity simply isn’t there. Also there is another logistical issue, people with driveways or garages attached to their homes haven’t considered that those who live in properties like myself that simply have a main road nearby cannot plug in an electric vehicle. Sure I could drape a lead across a footpath over night and then get sued as someone deliberately tripped over it or find it vandalised in the morning. There is a local block of garages that can be rented to house a car but the local council have long since removed the electricity supplies from them making them all but useless. Many of these garage blocks are now in a state of disrepair. I would be happy to pay rent for a garage with electricity, it could be metered if needs be. If the government are hell bent on taxing the latest so called environmental issue, how about putting that money back into the systems needed to support so called cleaner vehicles of this latest fad? Another note that has been highlighted – go after the car owner but I don’t see lorries, vans, barges, trains and older buses and generators etc etc that exist in the city centres being tackled first. Clearly this is a complex issue, and from the comments above, lots of ideas, but little agreement. On a personal level, my office in Glasgow is adjacent to the most polluted street in the city, and at the rush hours it is full of idling taxis, parked down both sides of the street, all of them diesel. On a windy day I can walk down that street, but if the air is still, I can hardly breathe. There has been a lot of concern about diesel particulates, but no mention of other particulate sources such as aviation (near airports), petrol engines, brake, tyre and road surface debris etc. Do not victimise the modern diesel, which has low CO2 emissions, without also looking at other comparable sources of particulates. The least polluting engine is the one that is switched off. We must look at ways to reduce our use of vehicles. The problem with diesel engines is they are ubiquitous and to ban them entirely from certain areas is both knee-jerk and nonsensical. Manufacturers should certainly be looking at how to improve efficiency and lower emissions of all types, but this should not be funded by taxpayers. The big motor companies are more than capable of spending a bit of money on R&D, but this would have to be pushed by a wholesale clampdown by government through a change in legislation (as was done with gas boilers in 2005). If you want to continue selling your products, you adapt them for the market. Many years ago, I remember seeing James Dyson on TV talking about his ‘city filter’ for diesel exhausts – I wonder what came of this. And is disagree entirely with the recent trend for ‘scrappage’ schemes (is ‘scrappage’ even a proper word?) Perhaps you can replace an old version of something with its more efficient modern equivalent, but it’s not that straight forward. The new thing has to be made, probably using raw materials hewn from the earth at considerable environmental cost. Nasty chemicals are probably used somewhere in the manufacturing processes, then you need to transport the product and do the same thing in reverse for whatever it is you’re replacing. If something is broken or past its useful life, fair enough. If you’re binning a vehicle made a few years ago for little emissions gain, that doesn’t make sense. Moving vehicles away from city centres, maybe to a park and ride, just relocates the problems. Public transport needs to be improved and integrated, as is the case in many European countries, but people also need to be less reliant on motorised transport as we know it. And let’s not forget that the more people there are, the more complex the situation is. The answer can only come from sensible discussion of the options and careful implementation. That means no lobby groups throwing their weight around, no vested interests, and proper consideration of the many variables. So in this day and age, we’ve got no chance. Lots of interesting comments – here’s a other. Having spent a lifetime in engine development – largely for motor sport, I recall a test programme we undertook in the nineties on diesel engines. One needs to understand the function of a compression ignition (C.I.) engine and in particular, that they run lean of stoichiometric (as opposed to petrol which runs rich of stoichiometric). Diesel/C.I. engines have open inlet pipes and no throttle butterflies so the engines start off with no fuel and gradually you add the fuel via injectors until there is enough to burn. Looking at cylinder pressures, the point of ignition is very interesting and as the fuel begins to burn but before there is enough energy to drive the piston down the bore, there is a big hike in combustion temperature – and it is this “big hike” that appears to be responsible for producing NOX. We experimented with a device which partially distilled the fuel, taking vapour from the diesel fuel directly into the inlet manifold leaving the higher density & higher calorific part of the fuel to be injected in the normal manner. The effect was to reduce the sudden hike in combustion temperature, lowering NOX at the same time. Also, we were able to retard the spill timing and reduce the familiar “Diesel knock”. At the time it was a major breakthrough but unfortunately for us, coincided with the Fiat invention of the common-rail injection system so our investors got cold feet and the programme was dropped. As far as particulates are concerned, it was never possible to reduce them by much and I would suggest that filtration would be the only way to clean up exhausts – along with getting rid of those ridiculous traffic-irritating bumps on minor roads which must be adding significantly to particulate pollution!!! Sorry HMG, but we’ve seen through your dasterdly schemes! As far as ‘city’ air quality goes, HGVs and Buses seem to be the worst offenders, judging from the crap I see coming from the tailpipe of the one in front of me! Perhaps ‘The Engineer’ can be persuaded to publish a report on the ‘true’ emissions (all of them) of various fuel choices, and what technologies could be adopted to reduce the various emissions so that we can have a fair debate about transport options? Diesels are more quick to heat up than petrol based engines + slow moving traffic means most petrol cars pollute constantly more because the cat never gets to temperature, whereas a diesel gets hot regardless of tick over conditions. Second ,aircraft give burnt kerosene particles out of their engines far worse than cars, especially on take off. In north Birmingham when they changed the runway at B’ham airport kids asthma attacks went up increasingly since then. There were no real problems before that when I was at school back in the sixties & there were far worse smogs in the city back then! The other thing that comes to mind is that if everyone went back to petrol based cars, the government would make more tax out of the extra fuel used! By far the most polluting situation in cities is when combustion engine equipped vehicles are packed together and stationary or slow moving. Congestion also reduces the country’s economic productivity. The mix of diesel vs petrol by total engine capacity is usually biased heavily to diesel owing to its higher efficiency and longevity. Substituting petrol for diesel will increase CO2 output and vehicle replacement rates and reduce exhaust, (only), micro-particle and NOx output. We would still have larger particles, NOx, Co2, Co and congestion. A better approach would be to eliminate the congestion. Options to achieve this include: swap vehicle tax from VED to fuel, encourage park and ride, video conference hire facilities, staggered work start and finish times… Find out where everybody is going and eliminate or substitute it. Wholesale replacement of the diesel fleet will create large amounts of pollution which would far outweigh the pollution which would have been emitted by the diesel vehicles used to the end of their lives. Given that most of the replacements would be imported, this would equate to a massive balance of trade loss to the country. Fixing congestion would create a massive economic boost. Banning all diesel vehicles will unquestionably be the most effective measure. That of course doesn’t mean it’s right or at all realistic. Perhaps better to ask which measure is best. In that case incentivising the scrappage of diesel vehicles would be the option to go for reducing toxic pollution (though by far the worst for reducing life cycle CO2 emissions). The real problem is congestion in our town and city centres. There are just too many slow moving vehicles in a confined area. It would be far better to reduce the number of hydrocarbon fueled vehicles in these worst affected areas. This could be done by encouraging car sharing schemes and discouraging single occupant cars by having a congestion charge based on the number of passengers they carry ( more passengers = lower charge). This also has the added benefit of reducing the number of parking spaces necessary. The facts about diesel emissions have been known for years. There have been no recent ‘revelations’ in this area. Modern diesel engines are fitted with abatement which makes them the cleanest they have ever been. Genuine alternatives to the combustion engine (e.g. fuel cell) are very much on the horizon. Why is there a sudden step-change in the official attitude to these engines? I am inclined to wonder if there is an hidden agenda at work here. More tax off petrol than diesel as you use more of it! Diesel does create more NOx in the engine, BUT After Treatment technology also exists. One eminent engines expert I talked to recently said that the technology does, indeed, exist. Their estimate was that it would add between £500 and £1000 to the cost of a car. Written off over the life of the vehicle – longer than petrol if you believe the hype – this is hardly a killer alongside the fuel savings. The government just has to work out how to promote the take up of the new technology. Of course, it would have been something that the UK could have done in concert with the other members of the EU. But now it will have to go it alone, and with its hands full with Brexit, it may take time to get round to the task. It seems the whole debate is centred around Petrol Engines causing no environmental & health problems, but Diesel Engines cause all the problems. Old petrol engines will emit particulates because they will burn some engine oil. Herein lies the problem – all the arguments seem to be based around the “officially” tested emissions of the vehicles, not the real life results. Everybody should read the recent (April) Which report on air pollution & the testing they did on a variety of in service cars. Interestingly, although the VAG group did cheat the official test figures on some engines, all their brands came out on top for real life emissions compared to other brands in this report ! This should not be a surprise to anybody who knows about the quality of German made cars (just ask a good Vehicle Mechanic !). So before anybody starts putting more taxes on every make of Diesel Engine vehicles, lets just get the real world emissions established before acting in haste !! Well I haven’t had time to wade through all the comments so what I have to say may have been covered. Many of the comments are based on cars because a lot of people have them (mine is a diesel). However looking at it globaly what proportion of the toxins is from cars . Are there any figures on emmisions by buses, trucks, railway locomotives, standby generators, portable generators, dockside van carriers, ships etc etc. If we banned the diesel engine today the economy would grid to a halt. The solution is improved diesel engine technolgy. Air chemicals emitted from diesel and petrol engines are so small they are ‘barely measurable’, according to world authority the National Physical Laboratory. There is no evidence of ‘thousands’ of premature deaths as mortality is rising steeply. BBC R4 prog said the ‘premature’ period ranged from ‘three to six weeks’. Air chemicals can’t be called ‘pollution’, not in a month of Sundays. Ships, work boats, lorries, trains, agricultural vehicles, construction vehicles, generators, buses, council vehicles, military vehicles, private vehicles. When you talk about diesel you need to take all of them into account. Let’s move banks and insurance companies out of The City, and into residential areas, Rugby for example, to reduce commuting. Would that help? Good common sense from Marcus Gibson and Nick Doddle as the issue of “pollution” is becoming the new AGW fear campaign. Certainly we must continue to improve the environment, and have never stopped that activity, but economic sense needs to be applied, as it always was under BATNEEC. The worry is that the “Fear Campaign” experts will escalate the problems into a crisis based on half-truths that are difficult to challenge and do not attract the same journalistic attention as “thousand will die according to statistical analyses, with the sub-text …… but possibly only a few as the model is crude …. ignored” . Is the data on health impact of NO2 reliable enough to support current policy?